I was thinking a week ago that I hadn't bought anything from Primark in a long long time… then two gems come along at once! Last weekend when I was home, I picked up the Ramones slashed tee and this stripy sweater. I mentioned a few posts ago I didn't really own anything red stripey and now I have two items to add to my wardrobe. I like this jumper as I think it looks quite ~french and I actually bought it mainly to wear on holiday. I know its a bit weird thing to buy for holiday but its quite thin and lightweight and I think Im going to wear it over a bikini during the hotter times in the day to try and keep some sun off me. Plus I'm not that confident with my middle (its my problem area ): ) so it's nice to have a thing to throw over to cover up! 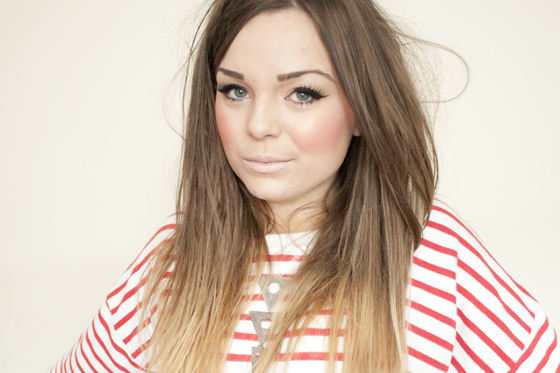 Today I've just been blogging like mad, hence the super casual comfy outfit. I decided to work my way through my epic stash to try and reorganise it and throw away all my expired makeup. I've drafted so many posts for the upcoming weeks! I actually felt a bit sad parting with makeup and skincare that I've had for a while, even though I know its out of date and I don't use it! I've recently bought some new storage recently which I LOVE, including the Ikea HELMER which is an actual godsend for makeup storage! I actually can't speak highly enough of it. I might do a post on some of my new storage actually as I actually love it that much! I've always been so protective of my stash and never really wanted to or felt the need to show it off, but I think my new storage really has swayed me! I also did a super informal but fun video on my ETCLLYMLRS youtube channel just answering some questions from a tag I found on Youtube. Im sorry if the volume is super low, its normal on my laptop so I don't really know how Im going to get around fixing it when it isn't an issue for me! We shall see! love the stripes! especially paired up with the flowy skirt. the look is lovely on you! Would never have put those shoes down as being from Tesco, literally can't tell them apart from the Topshop version that everyone owns!! Love, love, love that nail colour! Also your make-up is quite literally flawless! You look so amazing, that top is so cute! I love your nails and your rings, I really want to buy some from your shop! Love this look, and you look so pretty! I'm a big fan of stripes and this outfit is ace. Nice stroage set too! I really need to have a sort through all the junk I own! 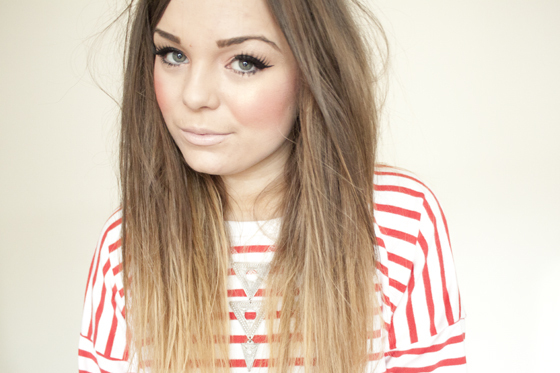 Love the combination of red & white stripes with the bright blue nails, looks fab! Gorgeous outfit, and I love the colour of your nails! I think I might paint mine now. Love this outfit! I have similar pieces I'll probably wear it soon! I am loving your sweater and your nail polish!! I'm loving the tawny looking make-up in this post :) I own quite a few stripy things already it's prints like what you usually wear that I'm needed to stash up on! I love this outfit, you look so sweet! Such a great little sweater and I love the colour of your nails. Great shoes too, good old Tesco! So, so, so, so cuteeee! Lovely top on you - would look great with a red lipstick to! 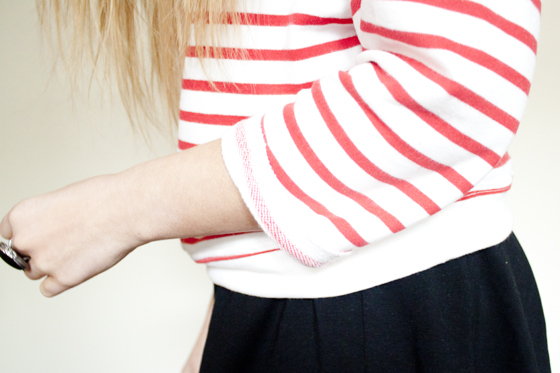 Ooh I love the red stripes with the blue nails, such a holiday inspired outfit! 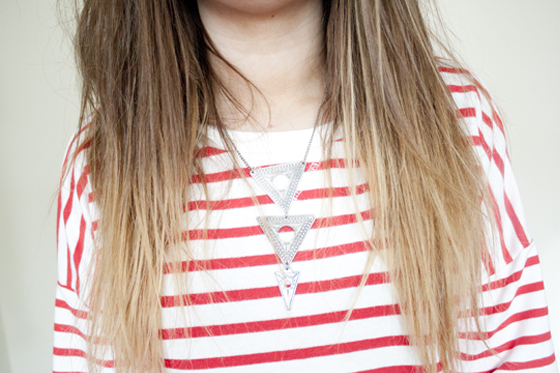 Very cute look, kind of nautical meets rock and roll. You look so beautiful! I love your hair and nails!